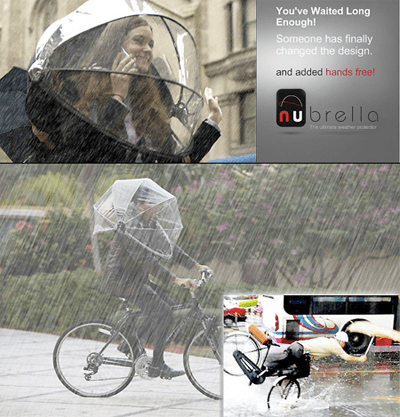 Billed as “an umbrella with no hands”, the NuBrella (launched in 2008) is a pop-up, strap-on, fully shielding, protective environmental cover. For less than $50, you can see where you’re going when you’re walking, and you take up less surface area on the sidewalk. Short people probably love umbrellas, but for tall people they are a real hazard. Here’s the ABC News interviewing the inventor on inversion’s impossibility in his innovation. I just ordered two from their online store. We’ll see what mischiefery we can pimp them out with. I can see why people might feel a bit strange wearing this on city streets (although you’d be one of the least strange people in certain parts of San Francisco). For Burning Man I think it’s awesome. Even if it’s not raining, there is so much scope for attaching EL wire and leather feathers.